Announcing a new feature I’m going to include on the blog for Tuesdays in 2012! College success is really all about strategies, so every Tuesday I will give you 3 quick strategies that you can implement into your routine right away to give you a boost towards reaching your goals. Here are this week’s 3! 1. Decide on a set block of time you will study/work on homework every week this semester and set phone reminders (Google Calendar SMS set up is great). Schedule the blocks at no more than an hour or two at a time and stagger as necessary. Stick to those reminders every week. If the alarm on your phone goes off at seven o’clock and you are on Facebook, sign off, change locations, and get to work. This will pay off with A’s. 2. 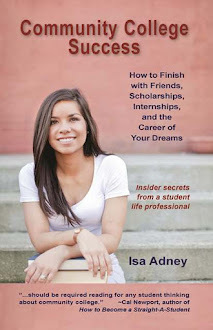 Read a book about your desired major/career. You’ve been there, standing in line at your college bookstore, paying hundreds of dollars for a book you may not be all that interested in. It can be crazy, but reading will always play a huge part in how we learn. So why don’t we read more books on topics that truly relate to our own lives and personal goals? Search your college’s library, your local library, or Amazon.com for a book that relates to your desired future profession. And then read it. 3. Write down one question from your required reading this week to ask your professor in your next class. Never go an entire week without contributing to class discussion. Make it a goal to speak up at least once every class. Professors who remember your classroom contribution will be the ones ready to write you a recommendation when you move on or graduate. Success is all about small daily habits. Ask any student who get’s straight A’s. Ask any athlete. Ask any mom. It’s the little daily things that move us forward. And missing out on these small things every day are what can take us down. I hope these tips this year will help you lift off every day towards your better life.